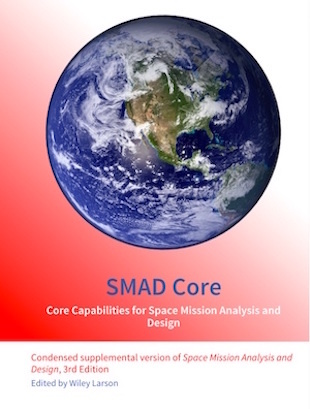 This electronic version of SMAD CORE provides focus on selected information in Space Mission Analysis and Design, 3rd Edition, Third Printing, 1999, and provides updates and amplification where appropriate. This book will provide you with the process, tools and data to begin with a "blank sheet of paper" and design a space mission in sufficient detail to identify key drivers and make a preliminary assessment of overall performance, size, cost, and risk. As much as possible, we have provided physical and engineering data, rules of thumb, empirical formulas, and design algorithms based on past experience. It's assumed that readers have a general knowledge of physics, math, and basic engineering, but is not necessarily familiar with any aspect of astronautics and space technology. Inkling ebook/ Available on your Mac or PC; Downloadable on iPad, iPhone or Android. Download a digital copy of this book. Cost-Effective Space Mission Operations, 2nd ed.